Please note that massage therapies are only for bath guests in Gellert Spa. Each massage needs to be accompanied by a bath ticket. You can book your Gellert Bath aroma/thermal massage treatment in advance to schedule it as it is most convenient to you. Aroma and Thermal Massage treatments can be bought at the cashier in Gellert Spa, but there is no guarantee that there are available massages on the day of your visit. Most treatments are booked in advance. If you do not intend to book a massage online, you can ask at the cashier if there is any available massage for a given day. Please note that massage is only for bath guests with a valid bath ticket. Please note that besides online booking, the Gellert Massage treatments can be bought at the cashier in Gellert Spa, but there is no guarantee that there are available massages on the day of your bathing. 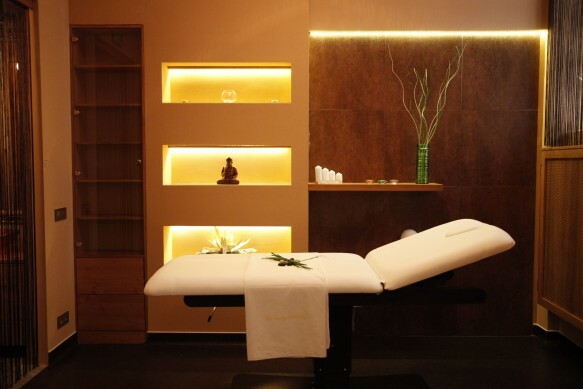 The vast majority of massage therapies are reserved in advance. If you do not intend to book a massage online, you can ask at the cashier if there is any available massage for a given day. Please note that massage is only for bath guests with a valid bath ticket. Another option is to buy your massage treatment in advance, and finalize your treatment hours 1-2 days before your visit. In this case, you can order your massage and bath ticket as a Gellert Gift Voucher (1 year validity). Natural Spring Water Baths in all pools in the Art Nouveau bath palace of Budapest, Gellert Spa. Private Bath in Gellert Spa: 3 hour use of the private bath in Gellert Spa with a bottle of Champagne and a fruit bowl for 2. Available for 2-4 people for 3 hours. Not included in the bath ticket, but no bath ticket is needed to enjoy the 3 hour private bathing. 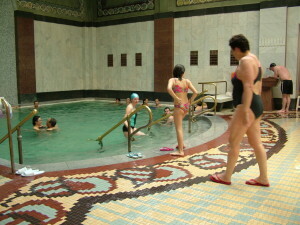 Medical Mud Treatment: For medical mud treatment, the referral of the rheumatism specialist of Gellert Spa is required. The price of the medical examination is HUF 10,000. Price of the mud treatment: HUF 1,000. Restaurant with hot meals is available in the hotel (Hotel Gellert Danubius) booking directly through the hotel (not via the spa). 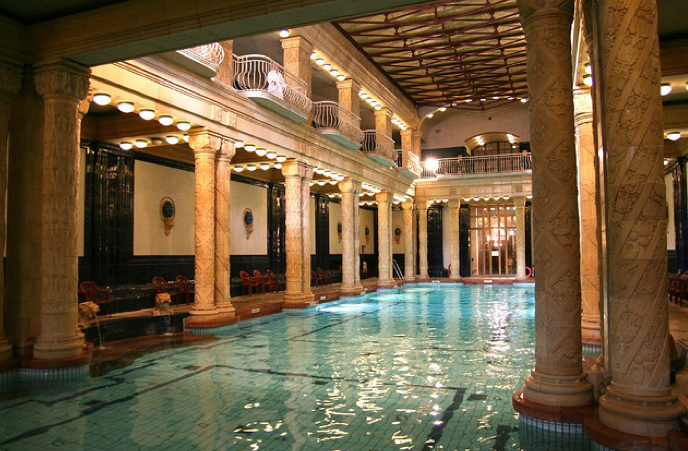 There is a tour for visitors only (not including bathing) in Gellert Spa every Tuesday, Thursday and Saturday from 11am and 3pm. The visitor ticket is HUF 2,000 per person. No advance booking is required. Please note that this short tour is not guided. 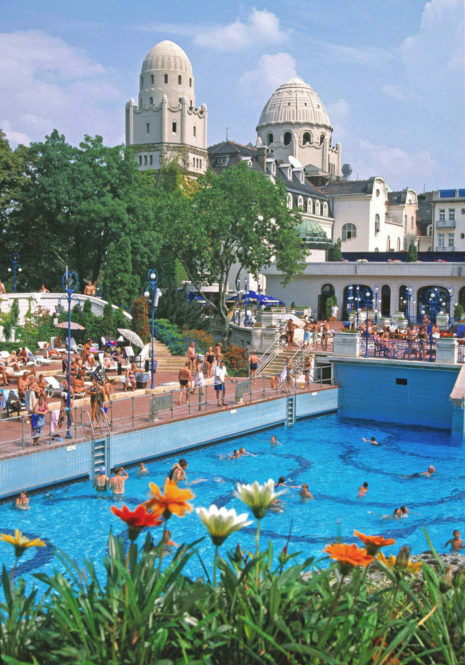 Gellert Spa Bath is fully wheelchair accessible and some of its pools have a pool elevator to lift bath guests into the pool. I would like to know more about inhaling therapy. I have chronic allergy and also sore throat due to reflux, hence I would like to know if you have any inhaliong therapy for this. I am planning to visit Budapest for around 1 week in July between 7 and 15 July, how to book the treatment? Please let me know. Do you recommend any good hotel to book in that period? I am sorry, but inhaling therapies cannot be booked online, only at the spot of the spa. 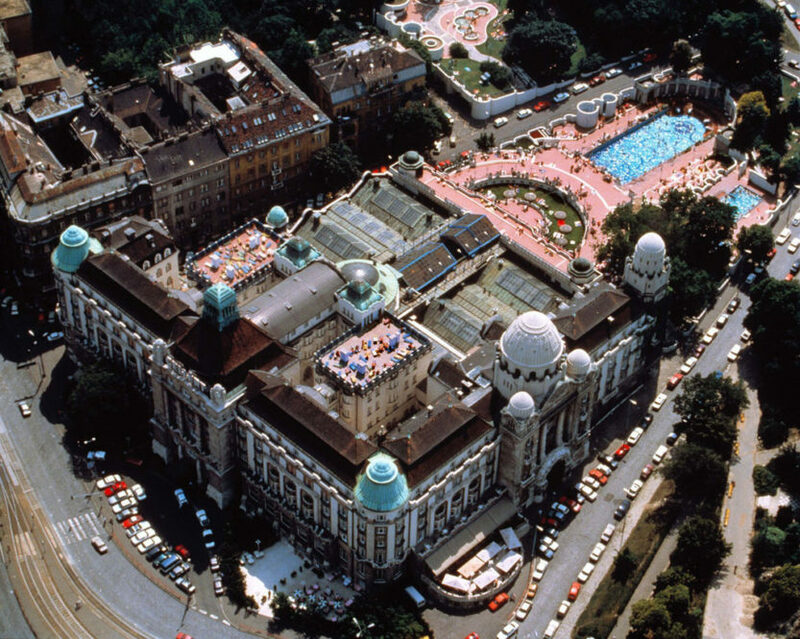 Should you wish to stay nearby, I would suggest Hotel Gellert. in that case please book 1x thermal and 1x harmony massage and leave a comment in the comment field that you would like to have it together in the same room. Hello again! I am unable to book a Couples Royal Thermal Massage – it does not appear in the pull-down menu in the booking form. I have sent an email to info [at] gellertspa.com asking for assistance. thank you, we will reply to you in email. We will be in contact with you via email. Thank you for your patience. We visited the Spa last year and had a wonderful time. My friend bought some of the facial treatments and she loved them. I understand that they cannot be shipped to the United States but my daughter lives in Wien. Can facial mud be shipped to Wien? Thank you. Will be there again in January. please contact the beauty salon directly. I will email you with more details. I’ve just booked a spa ticket but think I have enter the wrong (incorrect spelling) email address to send the email tickets to – thus have not received them. The booking is for 2 adults on the 22nd of July totalling 44 euros. Can I please have an email or contact, or directly sent to my email provided, to get the tickets re-sent. Thank you. We have re-sent you the confirmation email. Hi I am looking to come tot he Spa in December and was considering the foot massage but notice that the Aroma Massage is put as relaxing not deep tissue. can you confirm that there is no digging in with this massage and what part of the body is covered? Last massage i had left me bruised on my back and unable to move. Yes, the Aroma massage is a gentle treatment, more like stroking than a strong massage. This 20min massage treats only the upper body (back, shoulders, neck areas), so the lower part of your body will be covered. Swimming caps can be purchased for HUF 1,000, and bathrobes can be rented for HUF 2,500 (+ a deposit HUF 5,000). if you wish to buy different type of treatments, you will need to make 2 separate bookings. Please ‘walk me thru’ the process regarding ‘tickets’, I have no idea what that refers to?? I’m attempting to book a 90 minute Thai Herbal massage, but don’t see the correct steps of that process. The online booking isn’t cooperating?? please assist… (I will be booked at the Hotel on 10/31/2018.